CXpert associate, Sean Heylen, steps in today to deliver his review of a brand new Customer Experience report from the US. A key study has detailed how leading businesses across a number of sectors have made Customer Experience, or “CX”, their core strategic focus, and how it is providing excellent results for their customers, employees, and in turn their shareholders. Have A Nicer Day – Learning From The USA’s Customer Experience Leaders was produced by consultancy company Nunwood and is focussed on researching, analysing and applying customer experience best practice from around the world. The paper is a great read for anyone interested in learning from best practice to improve their business and its leadership capability. Some example businesses in the study are Amazon.com, Disney Parks, Krispy Kreme Donuts, Costco and Southwest Airlines. – Omnichannel supplants digital – the distinction of online and offline has faded and there is increasingly a digital element in every touch-point. Each of these themes has a number of steps and/or components in best practice and the various case studies in the report provide excellent examples of these steps across the 5 different industries and the various business types and sizes. Personalisation – using individualised attention to drive an emotional connection. Time and effort – Minimising customer effort and creating frictionless processes. Empathy – achieving an emotional understanding of the customer’s circumstances. Each of the pillars has a different level of impact on advocacy, loyalty and therefore shareholder value creation. Strong performance across the 6 Pillars will drive these things, however. Customer experience strategy – figure out how to define strategy, communicate the vision and have their team rally behind the customer focus. Journey mapping and CX design – making CX mapping and design a core part of day to day business, not just a one off project. CX measurement/voice of the customer – making sure that CX measurement actually engages staff and is relevant to their performance, not just describes customer feedback. Cultural change and employee engagement – setting up the business and its systems for the best customer outcomes. In conclusion, the report provides an excellent overview of the trend toward serious and systematic CX in some of the USA’s most successful companies. 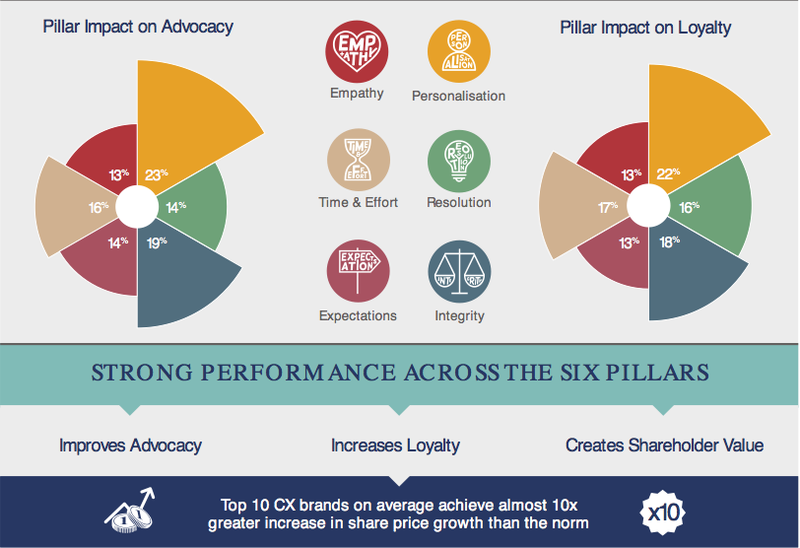 An analysis of your brand against the Six Pillars with comparison to the best practice leaders is a great place to start your CX journey!